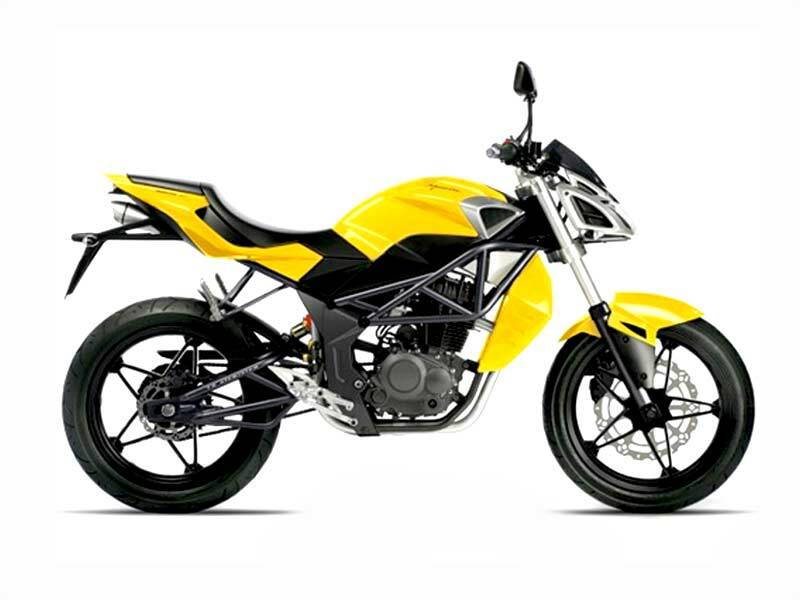 Mahindra Diablo 300cc bike is the latest addition to the two-wheelers manufactured by Mahindra & Mahindra Limited. Check out the specifications and price of Mahindra Diablo in India. Indian automaker Mahindra & Mahindra Limited has revealed its latest trendy bikes - 'Cevalo' and 'Diablo', in September 2010. Mahindra Cevalo is a 125 cc bike, best suited for daily use, while Mahindra Diablo is a 300 cc bike, which is a perfect fit for both city roads and off-road tracks. Diablo looks just like a motorcycle designed for race tracks. The bike is powered by a sturdy 4-stroke engine and is equipped with advanced suspension and braking systems. Mahindra Diablo, priced at Rs 1.5 lakh (approx. ), is targeted at the bike connoisseurs who consider their two-wheelers as assets rather than just being an automobile. It promises to deliver best mileage in its class, with superb performance that can be compared with powerful sports bikes. Mahindra Diablo is powered by four-stroke liquid cooled petrol engine, which promises to deliver maximum power of 25 bhp, with peak torque of 25 Nm. The engine is mated to six-speed manual gear transmission. The engine makes use of Capacitor Discharge Ignition System. The automobile gives the option of self start. With an amazing mileage of 35 km/l, the 300cc bike promises to deliver superior performance in bumpy roads as well as smooth highways. Aesthetically designed Mahindra Diablo is truly a delight for the eyes! It holds the position of one of the smartest two-wheelers in India. Frontage is the main attraction of the bike. Rear side of the bike is also stylishly designed. Adding to the appeal is the chrome strip, which outlines many portions of the bike. Diablo is equipped with advanced semi-digital instrument cluster, which displays important information gear, speed in RPM and fuel level. Mahindra Diablo also promises to offer high level of comfort to both the rider and the pillion. The bike's seats are broad and comfy. The automobile comes with stylish side stand whish and wider foot rest, to assure that the pillion is comfortable during long journeys. Mahindra Diablo is equipped with advanced suspension and sturdy braking system, to provide high level of stability and control over the bike. For smooth operation and commendable mileage, the engine of the automobile is designed with sound technology. Light weight alloy material is used to fabricate the wheels of the bike, so that the rider gets a pleasurable ride both on bumper-to-bumper traffic on city roads as well as on the uneven off-road tracks. The aerodynamic design of Mahindra Diablo reduces air friction and improves the fuel efficiency. Making its debut in the motorcycle world, the four stroke petrol engine of Mahindra Diablo provides an average mileage of 33-35 kmpl.